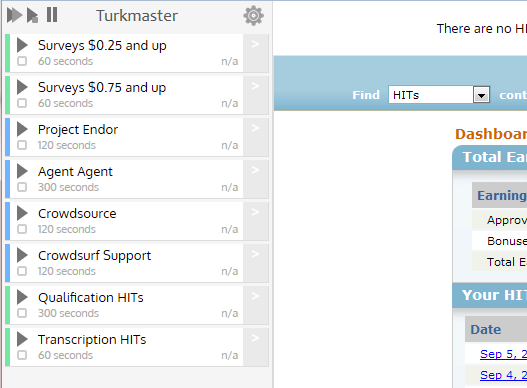 A page-monitoring web app for Mturk (Mechanical Turk) designed to make turking more efficient. 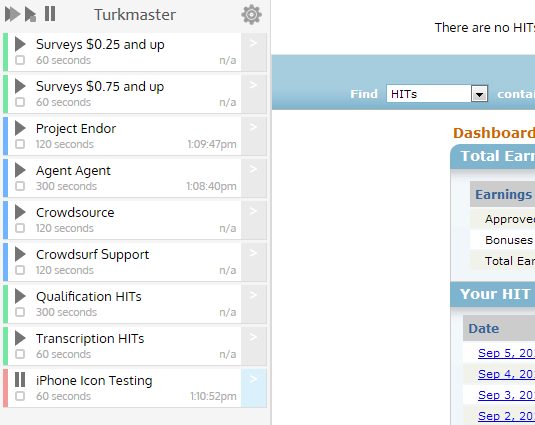 Easily monitor mturk search pages and requesters and Auto-Accept the HITs you missed. 2016-04-11 - Added Kerek's hotfix for the missing "Watch this HIT" button caused by changes to mturk. Thanks Kadauchi! 2015-08-09 - Added an option to disable the stop on captcha feature. Also changed the colors for running and updated watchers so they stand out more. 2014-10-12 - Fixed issue with watchers not loading. Also no longer loading external resources from non-https sites. 2014-10-09 - Watchers and user settings should persist after clearing browser history. Settings changes should save immediately. TO has cached ratings and other fixes. Other minor bugs were fixed, as well. 2014-09-21 - Added the ability to hide the watcher list to save space. Last seen hits are remembered after the page is reloaded. 2014-09-07 - Added the ability to ignore requesters. Hits from ignored requesters won't show up in notifications and will be faded out on the dashboard list. When you first install the script, you'll notice a list of "watchers" on the dashboard. The dashboard must always be open in a tab for the script to work. The first Play button at the top starts all of the watchers in your list. Under each of the watchers' play button there is a check box. You can select certain watchers and use the second Play button at the top to only start those watchers. The Pause button at the top stops all watchers. There are 3 types of watchers: Requester, URL, and HIT. Depending on the type of watcher there are a few options such as sounding an alert like PageMonitor and auto-accepting a HIT. When auto-accept is on you have an option to make it stop after catching a HIT (surveys) or you can let it continue to auto-accept for batches. To add a watcher go to a search page, requester page, or HIT and you'll see a button to add a watcher for the page. Clicking the button will bring up a form for you to give the watcher a name, set the interval time, and choose various options. Clicking the Save button will save the watcher to your dashboard and will begin running immediately. Here's an example of a notification for surveys 75 cents and up. You can preview or accept a HIT directly from a notification. The "+auto" button will accept the HIT and select the check box to auto-accept the next HIT. Click on 'mute' if a notification comes up that you don't want receive a notification for. This only mutes individual HITs - I haven't implemented a way to block requesters yet, unfortunately. For this script to work properly you will always need to have the dashboard open in a tab and it'll only run in a single tab. The script will disable itself in any other dashboard tabs if it's already open in an existing tab. It had to be done like this because of the way the tabs communicate with each other. 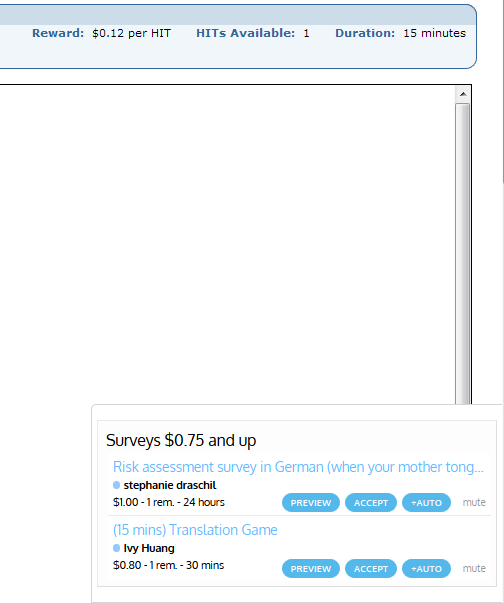 The notifications shown above will only show on Mturk pages. However, if you want to see the notification while browsing a forum, Reddit, or doing anything else, there is an option for desktop notifications. You won't be able to preview or accept HITs with those notifications, but clicking on them will bring the dashboard to the foreground with the notification highlighted so you can accept from there. That's about it. Please consider this a beta. I would love to get feedback (including constructive criticism), bug reports, new ideas, etc. There are a few known bugs (I know you can't turn off notifications completely) but they are very minor and won't affect users negatively at all. I just wanted to get this script released to give back to the community. Oh yeah, TO was recently implemented but isn't finished. I just wanted to have it on there in some form for the time being. P.S. I wanted give a special thanks to drpepper1324 from MTG for all of the great testing and feedback and well as the other MTG and MTF members who've tried it out and made great suggestions. It's truly appreciated!